The Galloping Gourmet Is Only A Few Days Away! Graham Kerr a.k.a. 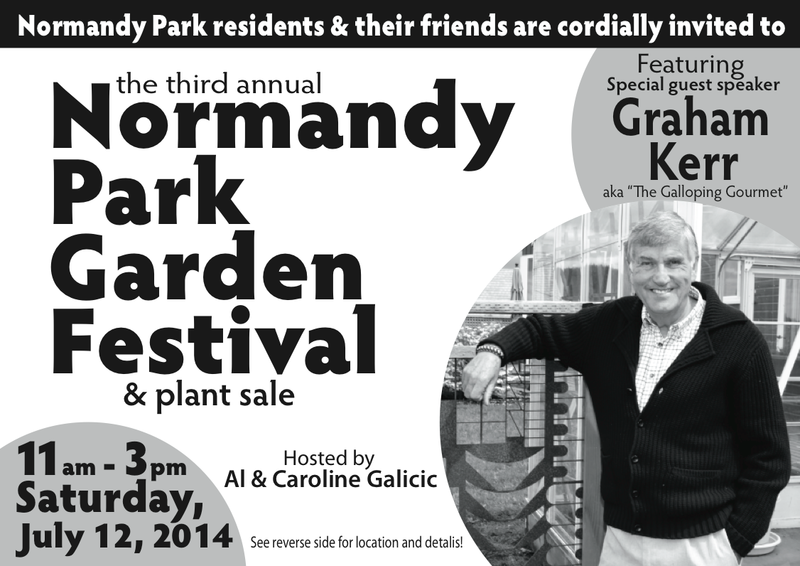 The Galloping Gourmet is our speaker at this year's Normandy Park Garden Festival & Plant Sale. It will be held right here in the garden and will go from 11:00am-3:00pm on Saturday, July 12th. Everyone is welcome - not just Normandy Park residents. It's free (supported by donations & plant sales) and kid-friendly (we're bringing back the bouncy house). 3:00pm: Plant sale sell off - After 3:00pm all plants will be marked down 50%. You'll find lots of good stuff!! We're selling tetrapanax, red castor bean plants, hardy prickly pears, brugmansias, canna musifolia (one of the best cannas for Seattle), hardy papyrus, kangaroo apples, fountain grass, lobelia tupa, elephant ears, fragrant lilies and much, much more!! Please e-mail me at jgalicic@gmail.com to RSVP if you'd like to attend. No tickets or anything - we just like to know how many people to expect. I'll send you our address when you e-mail me!